Rick Kustich is a fly fishing author and photographer. 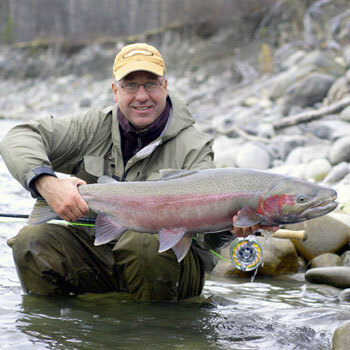 In January 2013 he released Advanced Fly Fishing for Great Lakes Steelhead which is his fifth fly fishing title. Rick’s work has appeared in numerous national and regional publications. He is also a fly tyer, seminar speaker and travel host and has produced a fly tying DVD. Rick has also spent time as a fly shop owner, outfitter, and fly fishing book publisher. Rick Kustich has fly fished for Great Lakes steelhead for over 30 years. Listen in and take advantage of his in depth knowledge on advanced strategies and techniques, two-handed rods, swinging flies and new fly patterns that are sure to get you hooked up on some trophy steelhead. Rick began fly fishing almost forty years ago on the lakes and streams of upstate New York. He has since traveled extensively to experience the finest fly fishing throughout North America and beyond but continues to find that some of the best fishing often exists in your own backyard. Rick spends a significant amount of time each year on the water and has developed a special passion for steelhead fishing in the Great Lakes and British Columbia.